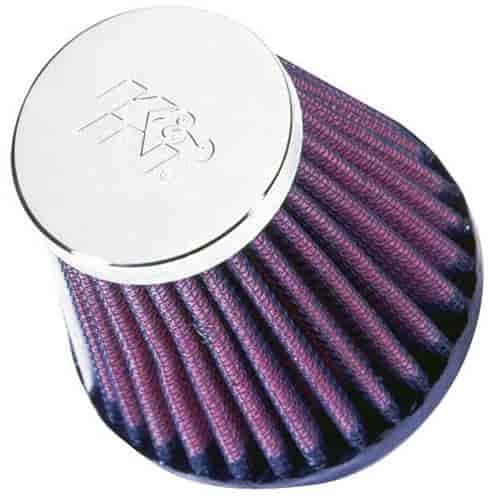 RC-2580 - K&N Round Tapered (Cone) Universal Air Filters is rated 5.0 out of 5 by 1. Rated 5 out of 5 by SlickRick from great products Was having trouble on a,502 rotax ultralight engine! Was fluttering, crashed last year, survived, told it was icing! Repaired plane, went to better fuel, few flights and fluttering again!! No power, pulled little off brand air filter off!! Worked on carb, found nothing, looked online and found story of guy that went as far as changing his engine and mechanic said did you change air filter? Dont tell me that was it!! It was!!!! So I looked up mine thru jegs from ordering there before when I used to build show cars and found what i needed in K&N! Knowing there the best! Started the plane without old filter and it Gained 400 rpms, put new filter on when it came, installed it!! Ran like a champ, same rpms without a filter, made a few passes on runway and took to the sky!! What a great non-restrictive air filter! ! Wish I would have had it last year! !! Lol. Thanks K&N and Jegs! !